Timber frame design and technology has come along way in the last 40 years. A modern timber frame building can outperform a reinforced steel concrete frame, which is almost the only construction method in Spain, in almost every circumstance. Whilst not unknown in Spain modern timber frames common place in northern Europe and north America. Often when I say timber frame to my Spanish friends and associates they hear “wooden house”. A wooden house conjures up something flimsy quick and temporary or maybe a cunning way to get around the strict planning regulations by claiming it is a temporary structure. A modern timber frame is far from this. So I prefer to talk about a timber structural system which is quite different to a wooden house. In fact you’ve probably been in many modern timber frame buildings without being aware thats waht they are. Most Travelodge hotels for example are modern timber frame. Faster: no drying out time, no delays due to bad weather, you can start fitting out inside almost immediately. More efficient: this is because the frame is pre-fabricated – that means dry, clean, factory conditions allow for precision engineering, there are fewer mistakes. There is vastly less waste on-site. Greener: well managed forestry locking in the carbon from the atmosphere actually makes a positive contribution to the environment as opposed to concrete which uses up vast amounts of water and fuel in its production and transportation. Better Buildings: the buildings are easier to modify for example changing the internal layout, they are easier to insulate because you can fill the panels with insulation, wood is a poorer conductor of heat, it is easier to avoid thermal bridges, cables and tubes are all hidden so your furniture fits in the corner for example but are all accessible for maintainance and repairs, there is total flexibility in appearance including domes and curved shapes, they are permanent structures lasting hundreds of years. Lightweight: lighter foundations are required saving money and time in their preparation. What about an increased fire hazard? : forget it: actually they are more fire resistant, and more earthquake resistant than concrete buildings. What about Thermal Mass? : Good point. A building with a large thermal mass offers protection against high or low temperatures providing the thermal mass is allowed to cool down / heat up overnight. If it can’t shed its heat, let’s say in the summer, then a building with a high thermal mass become a liability. In any case with good insulation and a well thought out holistic design you can insulated you building and protect yourself against temperature extremes. 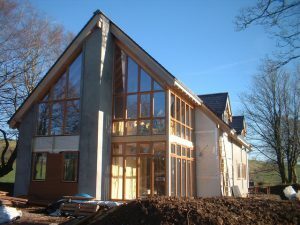 A modern timber frame can be enclosed in manufactured panels such as SIPs (Structural Insulated Panels). These are simple to assemble have lots of insulation and they add rigidity to the frame. If you want a modern look with clean simple lines and lots of glass this can be achieved with a modern timber frame. Bio: John is a founder of Eco Vida and is passionate about bringing modern design and construction practices to Spain. He believes a home which is warm in winter and cool in summer is largely a matter of design and selective use of materials. 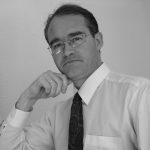 He is British and a Chartered Surveyor with 20 years experience living and working in Spain.